Pigeons are prolific breeders and are considered some of the most easy birds to care for and breed. They require a mate and optimal breeding conditions to begin breeding and laying eggs, once all their needs are met hens are capable of producing late into life. 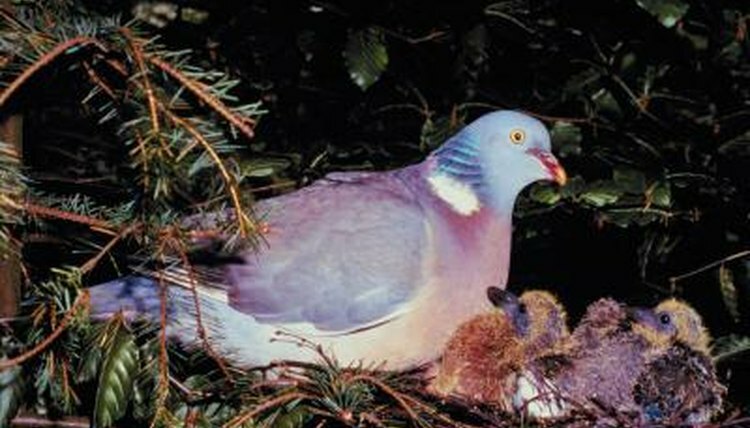 Every pigeon couple is different and will take different amounts of time to become bonded and be willing to mate with their partner, a process pigeon keepers refer to as marrying. Pigeons become sexually mature around 5 to 7 months old, but most breeders think it is beneficial to wait until after they are a year old to let them start breeding. Once your pigeons are old enough to breed, they can select their mate. Some studies suggest that females select mates who are similar to their parents, but scientists lack a complete understanding of how pigeons choose their mates. After your pigeons have been married, it might take some time for them to start breeding. Before mating, the male goes to find a place for a nest and if the female agrees on his choice, they make a nest where they can keep their eggs after they have been laid. After this, the mating process can begin. Although mates can be seen acting out mating rituals all year long, they are most often observed during the spring and summer. It usually takes 10 to 14 days for the first egg to be laid after a pair of pigeons have mated, and another few days for the next egg to be laid. Do not be alarmed if your hen lays only one egg, this is completely normal in very young or older hens. Both parents will take turns sitting on the egg, or eggs, until it is time for the new eggs to hatch. Providing your pigeons with a healthy diet of whole grains or pellets specially formulated for pigeons will ensure a higher chance of successful breeding and laying of eggs. A bird that is overweight or underweight could have problems with fertility. You should ensure that your birds have adequate room, comfortable nesting boxes and that their living space is not too crowded. If a space is open enough, pigeons will often breed in an attempt to fill the space but if there is an overcrowding of birds, they will slow considerably or stop breeding.